As Folkert Bloembergen, one of the speakers at the 7th SPICE webinar on 22nd February, remarked: “Making the innovation leap together remains a challenge”. That’s why the objective of the SPICE project to bring together public authorities to share their experiences in public procurement is so relevant. The most recent SPICE webinar sought to illuminate the subject of joint procurement, providing both a theoretical framework of the concept, as well as two practical examples from the Netherlands. The webinar started with a brief introduction into the SPICE project, given by project coordinator Dr Bahar Namaki Araghi (City of Copenhagen). Sebe Vogel (Rijkswaterstaat) then took the floor to explain the four different types of common procurement that SPICE has identified – joint procurement, partial common procurement, procurement by a central purchasing body, and procurements based on a common specification. Each of these types of procurement has a different structure and therefore also presents different benefits and challenges. According to the results of the SPICE project, by procuring together public authorities have more information on best practices and can learn from past cases, thus saving effort, time and financial resources. In terms of challenges, the most widespread are related to language and legal barriers, different perspectives on how to conduct the procurement process and what matters most in the selection criteria, as well as the amount of time common procurement takes. 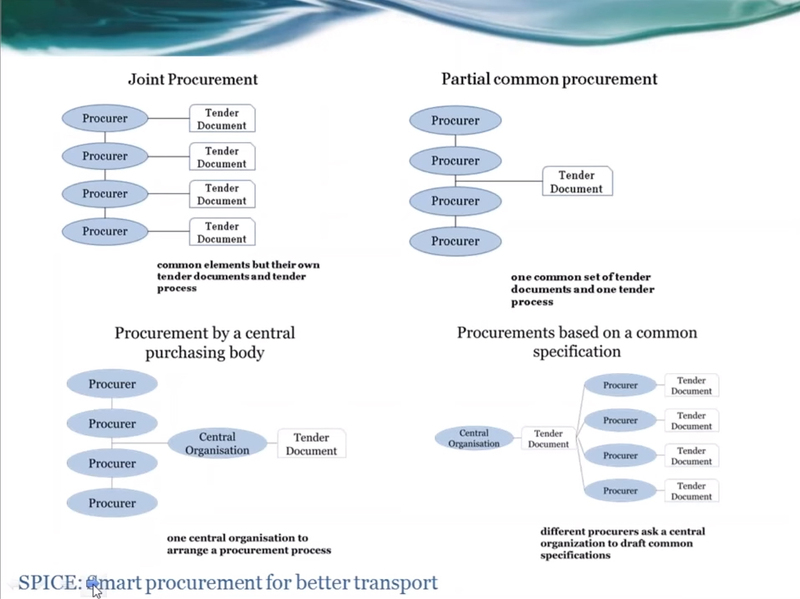 In the second half of the webinar, some practical examples of common procurement were provided by Edoardo Felici (National Data Warehouse for Traffic Information, NDW) and Folkert Bloembergen (Rijkswaterstaat). Mr Felici, from NDW – an organisation that has a central role in data collection, sharing and procuring for national, provincial and city public organisations – spoke about the national implementation of floating car data in the Netherlands. The Netherlands has decided to make a transition from roadside data to floating car data, which can provide more precise travel times and speeds, as well as better origin and destination information. In 2016, NDW launched a tendering process, focusing on how floating car data can be used to detect unexpected congestion. A pre-condition to the tendering process, in this case, was the Framework Agreement that NDW had signed with 14 private companies in 2013 and which also allowed for a faster process. NDW opens the Framework Agreement to new companies every two to three years. Interested companies are subject to two selection criteria, but must also comply with a series of documents. Interestingly, the Commission that judges the received proposals only asses the implementation and maintenance plans, without receiving information about the costs. Now that work with floating car data is underway, the plan is to continue and launch a tender for probe vehicle data. In the final presentation of the webinar, Mr Folkert Bloembergen (Rijkswaterstaat) introduced the innovation partnership Talking Traffic, in which regions in the Netherlands work together and have a joint tendering procedure. Talking Traffic works on six use cases, most of them related to traffic lights, in twelve Dutch regions. Tenders are carried out using the new EU procedure Partnership. The scope of the current tender includes more than 1,000 traffic light installations across the country, amounting to about 20% of all traffic lights in the Netherlands. In his presentation, Mr Bloembergen highlighted the many diverse benefits that come from working together, including improvements for cities and society in general, as well as for consumers individually. Overall, according to him, it is interesting to work together, as this allows public authorities to procure larger amounts and have partners with a broader range of experience on board. At the end of his presentation, he remarked that a key success factor in his experience was a willingness to “just do it” and that, although joint procurement is still a relatively new concept, public authorities can team up and learn about it together. Later this spring, the SPICE project will study more examples of joint procurement and Common Buyers Groups in order to put together analysis and recommendations for the use of joint procurement in the context of innovative procurement. The SPICE project will also organise a dedicated workshop on joint procurement at the beginning of May in Hamburg. If you have experiences with joint procurement and want to share them with others or learn more about the topic, please contact the SPICE team (WP4 leader Sebe Vogel, sebe.vogel@rws.nl). Examples of best practices in common procurement are available in SPICE project deliverable D4.1, available here.